My loafers had begun disintegrating. I sat with my back to the Kimbell Art Museum. Decaying spring dusk fell through the trees onto the lawn. My legs stretched out across the terrace toward the burbling pool. I fingered pits in the travertine. Iridescent grackles fluttered and splashed on the far end of the pool then reared up, whistling. Giants like the Kimbell are too vast to take in when I am in their midst. The built-in delay to ratifying our experiences in and around architecture is the most troubling part of the built world’s tendency to foster discursion. As perpetually satisfying as its blossoms are, dusting forgotten pollen on the longing stigmas of each moment, discursive thought is so mired in the tedious process of reflection that the sacrament of mass with an experience comes only through the layered epiklesis of simmering old images or concerns, like layers of immaculately marked onionskin forming a still approximate figure when pressed flat to a sunlit window. The full exposure of the experience requires more time than the situation itself, and does not quite lend itself to indulgence in the immediate tingling satisfaction of the moment. Thus my complex impressions in a building always seem to coalesce over time with others into an oddly magical misrepresentation of actual space and detail. This new, unreal building is my own. The gauzy figures of the Kimbell will coalesce much later as their tortuous profiles overgrow the simple filing system for the rest of my brain’s detritus. I am traveling in Texas again, in Austin to oversee construction of a courthouse for the federal government. The magnitude and reality of the endeavor grip me with the paralysis of an impostor. I haven’t slept. Business travel is an endless meeting resulting in a type of bleariness that distills my perceptions. Rather, it distills what my perceptions act upon. The detailed settings reduce to walls of a tunnel lined by uniform fluorescent lighting, where I float through a diffused experience that doesn’t solidify into material perceptions until much later, lying awake in the dark hotel bed. In a room, a meeting under an imperfect grid of fluorescent lights inflects into being out of the flat space of my reverie. For all the time I have spent in federal office buildings I have never managed to convene in a room with windows. This is disorienting because the archetypal federal building is conspicuous in most urban landscapes for having the most windows (Figure 1). The relentlessness of its glazing subdivision promotes the framed figure of the window over the transparency promised by the window opening. The deceptive fenestration of Kafka’s castle here finds mundane peerage: the building envelope manifests both the sovereign existence of the individual as one of many, and the loss of that individual identity in bureaucratic homogenization through a primary conveyance of promise in architecture—a window to the sky. For its uncertain physicality, its specious independence from the fabric of the town, the windows of the visible castle tower in Kafka’s incomplete novel, which would provide the only visual promise of hope of a reality beyond the exclusive otherness of architecture, that some salvation lies within, simply “gleamed in the sun,” opaque. Yet, all of this shrouds a building whose interior I am fortunate enough to gain access to only to find that there are no windows. 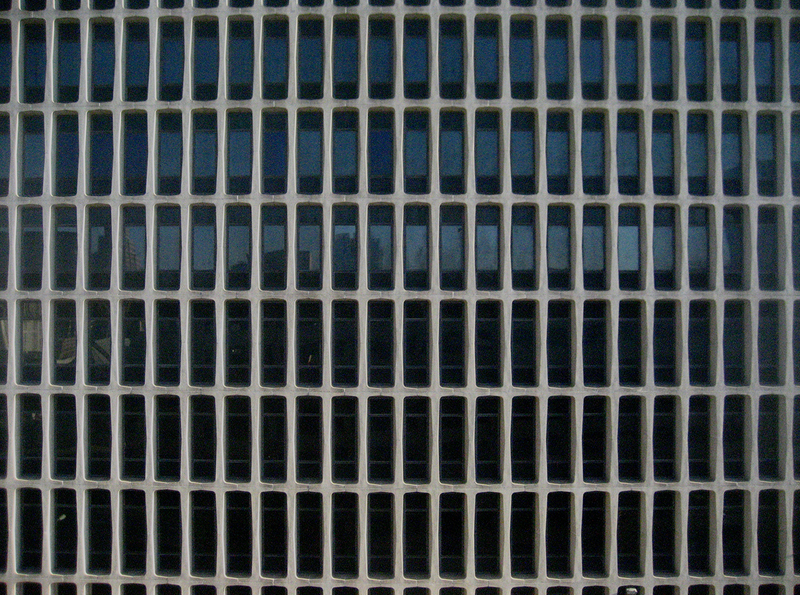 (Figure 1) J.J. “Jake” Pickle Federal Building, Austin, Texas. The historic downtown hotel is too nice for me. I take off my pleather dress shoes and tie and let the sun into my room for a while through slightly warm white sheers. Vaporous light packs around me like a cloud of down. The gauzy figure of the capitol dome is barely material, flattened against the glass before the viscous sky. In the luminous air over the bed I recall some velvet mornings in Los Angeles. Every drive from Cheviot Hills to Southern California Institute of Architecture (SCI-Arc) downtown was filled with promise. In 2000 I was meeting with or working with Perry Kulper (“PK”, his digital sobriquet, hereafter) every day. He was my thesis advisor and I assisted him in teaching a drawing course for first year graduate students. As knowledge of a person is limited to the arena in which they are made available, I believe through our deep connection in an educational environment I grew to project my nascent hesitancy to resolve architectural inquiries with complete and recognizable building solutions onto him as an educator rather than a builder. Perhaps I erroneously believed that his tenure in the world of drawings and words had something in common with my reticence. Rather than finding concern in this somewhat antonymic station of the architect, I found fullness in drawings, in words, and in the slow cook of discursive experience itself. Yet because of its openness and warmth these misguided projections are allowed to most wonderfully color the context in which I continue to situate his work. The source of my musings is an exhibition of PK’s work staged at The University of Texas (UT) concurrent to this bout of business travel. I call my old friend at the university, Leach, to coordinate our rendezvous at the gallery. I take off my dress shirt and put on some ragged fabric loafers. Dressed down I am only slightly less of a fraud. On foot through the city I am alone in the streets. Most everything north of the Capitol, before I get to West MLK, is closed. An odd assortment of daycare centers, old law offices, and a bootmaker line the street in low-slung 1960s far-past-modernism main-street U.S.A. storefronts made of deep-raked, painted-over brick or stucco with mold constellations. Gold foil lettering on the plate glass is blistered. The stretches of glass are so opaque with dirt and the spaces so dark or dim that I can place myself inside them between effects of reflection and transparency. These heaps are long dead, held together by coats and coats of paint. I absorb them at the pace of my footsteps. Later something will arise in my hypnagogic cataloging that perhaps was there or wasn’t. I might recall a window onto a stair oddly rotated away from the outside wall but rooted by a ceiling grid that diminishes to different vanishing points than the building, but not at the same time as the color of the brick or the abscesses of some poor jobsite decisions that have rotted out and painted over, cobwebs and all. The discourse of memories that conspires to build a building of impressions is often cobbled together from unrelated flashes that become so full as to seem complete, physical. When I finally arrive at UT I wander around to try to find Leach’s studio. From the foyer I see the glow of narcotic, incandescent light washing from the gallery into a long ambulatory. I have the sensation and trepidation of walking through a funeral parlor and seeing the pink saturnine light bathing the wallpaper from a side portal in the middle of the hallway, searching for an excuse to bypass it, to go spend time with mourners in the hallway, or to walk past without indulging in a glimpse into the room. A glimpse of the body forms a mold that casts living memories with the crushed petals of a dry mauve flower, and dust. It introduces a lifeless dummy into their name’s evocation. Recalling their smile, a brittle stitch-snapping leer arises. I had spent almost a solid eighteen months straight with PK and then only saw him once for eight to ten hours since. I didn’t want to cast him with mylar and graphite. Though I had indeed seen him more recently, the way he haunts me is through the last time I saw him in Los Angeles. As I watched us, somewhat separate, through the storefront lunching at Fred 62 or the windows of the Kulpers’ house, PK made use of time passing. He asked questions. His face gathered and froze with the strain of deep listening, as if every combination of words held a poignant but fleeting opportunity to learn, to recast a memory. The meals and conversations of that day were an effort in a life project, in ‘The Work.’ In the mind of a subscriber to the project of life, the wash of the senses was not a loss but a less filed amalgam, an impressionistic paste. ‘The Work’ was the critically detached, but retained, experience of life. The ongoing nature of the transformation of his life into his work caused the latter to remain in flux by the moment. His work drew people because it was alive in the way he was living it. I saw the paralyzing horror at finishing a piece or suite as overarching because it was the euthanasia of memories. The unfiled sheet of mylar still out on the table was the fulfillment of others’ idle wishes that a beautiful day in their lives should last forever. So the architect’s passion to carry on with working stayed alive and breathing in drawings. Though his racket was found in drawings, coming from an academic setting where talking about one’s work was its realization, PK’s indulgence in listening and the experiential vocality of his silent work characterized him more as a builder—buildings are silent—a stoic practitioner, than an academic showman. As the growing velocity of global culture allows the undigested impression, or worse yet, the vague conjecture, to stand as an artifact, the physical transformation of a working life into something other than the original experience was an invitation, more than the closed door of pastiche or capitalistic lifestyle-baiting that comprised much of the rest of the decade’s work. The transcendence of PK’s work became part of my life rather than a recognition that his life was merely occurring parallel. I sneak past the glass-walled gallery to the stairs, hazarding a glimpse of drawings ranked, arranged, and filed, their mineral eyes beginning to glisten. Leach, sitting next to his laptop in the studio with a drafting table perpendicular to it is immersed in the bright dullness of daylight and incandescence. We sit for quite a while talking in an intimate slot of his workspace about the tools we have as architects, or more precisely, the misconceptions we have about them that push more sensitive investigations of deep experience into a parallel realm of analogy or substitution. But the crux is that these tools communicate data of the eventualities of architecture, or often more accurately, the data of the framework allows for those eventualities, but they do not awaken or manifest them in their own flat corpus. We talk and move from the potage of light into the cool, lugubrious dim of a terrazzo stair that smells like the ghost of wood veneer, of dust and sun, the treads smoothed and sagging like those down into a hidden Venice rio. I envision communicating in the material voice of this stair in lieu of representations, a full-scale collage cobbled from odd vantages, lost spots, illicit spaces, and involuted passages. The manner in which people gather in a plaza during an event, autumn light through Gingko trees with a month’s loss of yellow leaves onto a brick embankment, the dusty cedar odor of a dry attic, the feeling and sound of a particular scale and shape of gravel underfoot, cats’ paws on a translucent roof, all stitch together into a blurred new memory of a non-existent building. The aspects of architecture that rely on reference funneled back into the hidden documents of our minds need other mechanisms for education and characterization than analogical or representational aids. These things can’t be drawn. But they must be drawn… perhaps by drawing around them. In the hush that only comes in single rooms which you cannot see the whole of from any vantage point, the incandescent lights creak. That funereal overtone that had arisen when I had first scurried past in the hallway is recharged. The gallery is a tall space populated with freestanding white walls that stop at eight feet. They coax down the impression of a ceiling to a more intimate, human scale. On the first panels in the room excerpts from PK’s landscape serials are pressed behind thin glass (Figure 2). He had, at points during the school year, gingerly laid these wafting leaves across the concrete floor of the long gallery at SCI-Arc’s Marina Del Rey outpost. The recollection of these works on the floor, lucky as I was to possess it, helped me sense what was different here in their display and how they differed in their actualization from the other drawings flanking them. The success of these works was their investment in flatness and their capability of distancing the viewer as one would take in the developed roll of a landscape from a peak or overlook. Without glass and on the floor they had been able to do two things: first, in their liberation, become visually tactile, including the withering ripples of aging or affected tracing paper; second, by dint of the floor’s extent, become expansive beyond their borders. Five feet and some inches below my eyes on the floor of SCI-Arc’s long gallery their quality of extreme distance was perfected; they became perspectival objects, not vistas into space, but Jeffersonian plats, filled blanks seen in space. 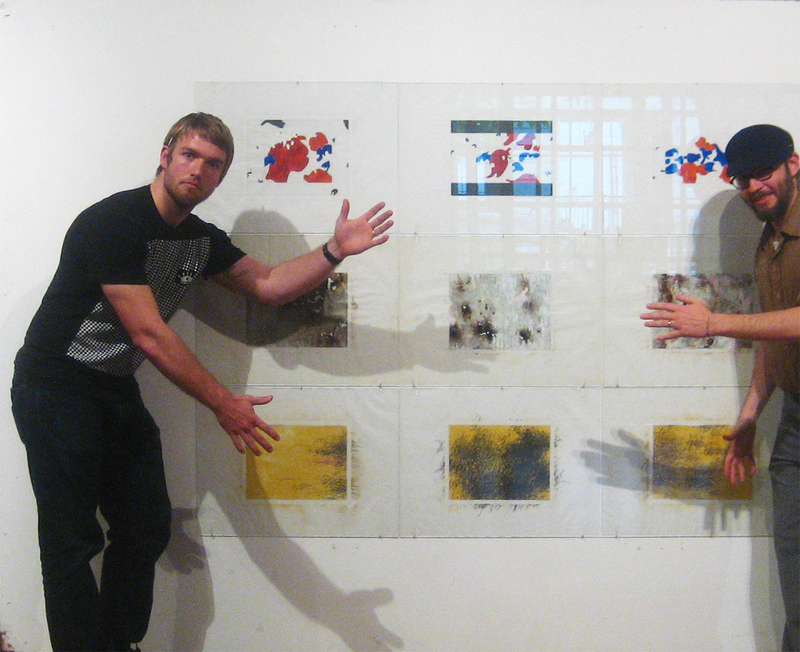 (Figure 2) Perry Kulper, Texas Range Exhibition, The University of Texas, Austin, Texas. There are conventional architectural drawings here. Although idiosyncratic in their pursuit and invention they still put something undeniable out as their mouthpiece, figurehead, or gatekeeper: a building. It is not the architect’s imperative for the building to speak for them, but it is imperative that the building speak with the voice it is given. A drawing of a building has the capacity to speak without the corruption of our open spatial readings. Yet by definition they feel little more than a tool, speaking with neither the voice of the building or the work of art. Still, as with all of his works, these have aspirations that are unmistakably PK. I miss hearing his voice. I stall out a bit from Leach at the David’s Island competition drawings. These old messes were the first image of PK I had. Seeing him again here is like catching up with an old friend at the haunt where you first met. More than the other types of drawings these glyphic fields or strategic plots seem to have PK’s voice, his demeanor, pace, and posture, from the measured words to the meticulous haircut. Because of their level of detail, the inclination with PK’s drawings is to approach them with intimacy, as one might scrutinize a lover’s skin. The graphite marks are microscopic and burned into the mylar with such precision that each dash in a ship’s-curved, hidden arabesque might be a text inscribed on a grain of rice. These are laden objects, weighted objects. It is at this scale that some secret and skew specificity and quantitative intensity are established. Moving out, ever so slightly, to where marks begin to group, two things are visible. First, like the quiet riots of Hejduk’s silent witnesses, geometry is marshaled as a communicative vehicle through connotative geometries. Yet an idea or arena does not emerge, only tones or poses. Unlike an architectural drawing, these do not have a scale, at least not one that is apparent, or one of use to its reading. Their scale is internal, not immediately relying on external relationships or keys to what it hopes to become, but what insisting upon what it is at that moment. Second, a skin spreads out somewhat translucent in its inconsistency such that it floats over the mylar and beneath the marks. The skin is in small part the schmutz of triangles and other drafting tools, and in large part the fog of his construction marks (Figure 3). Even more so than the quantitative intricacy, proof enough of hunched hours, this rind, to which he punningly alluded in a previous exhibition, this “calculus,” as both the division of complex forms into discrete, understandable packets or the lithic accretion of minerals in the body, is an index of investment, of life. The function of drawing as a surrogate for experience, or at the very least a record of passing time, is worn into it like the depressions on those stair treads, the dirt from a cat’s oily flank built up on a door jamb, or the acute stone corner of Pei’s National Gallery polished by fascinated hands. This dirt is the patina of time and action in the lives of real things. (Figure 3) Detail, Perry Kulper, Texas Range Exhibition, The University of Texas, Austin, Texas. PK’s friendship with David Leatherbarrow, who co-authored, with Mohsen Mostafavi, the book On Weathering: The Life of Buildings in Time, must certainly have touched upon the nature of age and staining in the life of the drawing itself. The drawing is the record of the architect’s life with the building. This life ends with the occupation of the building and the final as-built state of the drawing. With unrealized works the architect’s life remains in limbo. 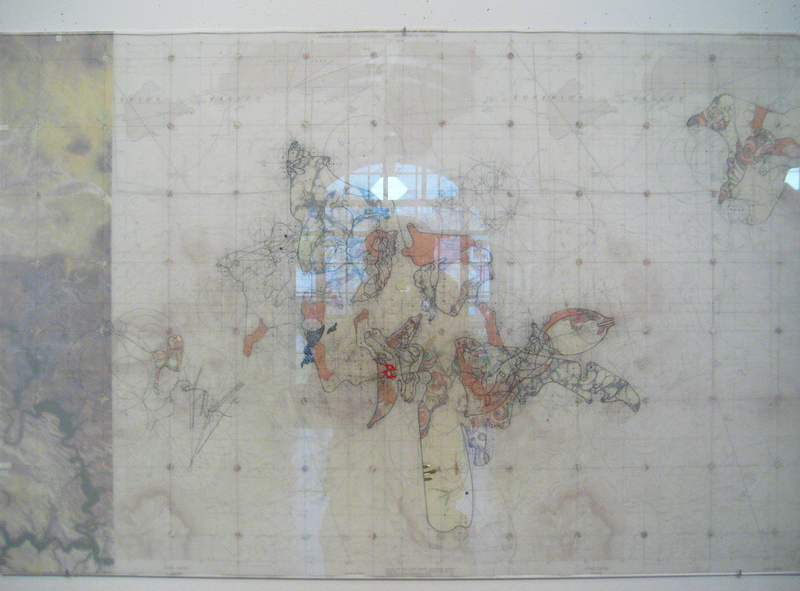 However, PK’s work recognizes its non-instrumentality while containing a cycle in which the process of constructing the drawing also wears it down to the qualities of its site, assimilates it, as Leatherbarrow says, “back into… the place from which it was first taken,” decaying back into simple geometries, dimensional tick-marks, and outlined ship’s curves. Would, in this context, PK have reflected on the fog of situating marks in his drawings as both constructing and being the intimation of the work’s death that Leatherbarrow equates to weathering? As he fills his work with this life, the simultaneous creation and dissolution may in the end be recognized simply as a way of filling life with work, much in the fashion of Bartlebooth in Perec’s La Vie mode d’emploi. I can’t help wondering if Bartlebooth’s Quixotic labor of painting watercolors of distant seaports en plein air, having the paintings dissembled into puzzles which he then reassembles, only to deliver them back to the site of their painting to be washed clean of any trace of his efforts, was at heart such a personal recognition of the architect’s efforts that PK and Amy (Kulper) recommended the book to me on the day I bid them farewell in Los Angeles. The calculus of PK’s drawings insinuates a second life lived by the information next to the architecture of which it might be the progenitor. This bilocation of the drawing’s consciousness is strong. It insinuates something that is not forward, not the instructional logic that turns mind into matter, but the physicality of the mind itself pressing against the outskirts of its own body, of the first architecture, that of our flesh, to imprint on the leaf of mylar film. It is trodden in, lived onto, bled across, architecture beaten out of life (Figure 4). In fact, PK, in his drawing courses, often characterized the expectations of what of labor commitment might lay behind a drawing in hours. “This will be at the very least a one-hundred hour drawing, I expect, no less,” he would say. 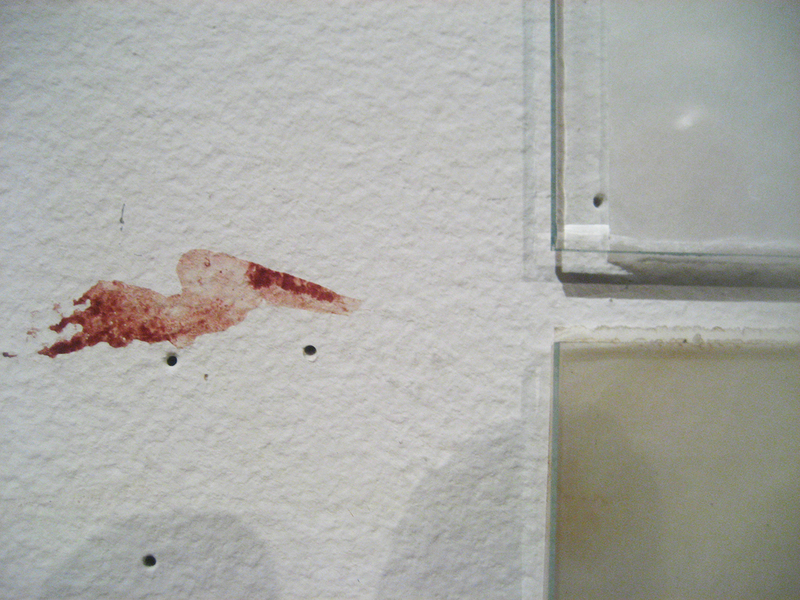 (Figure 4) Blood Stain, Perry Kulper, Texas Range Exhibition, The University of Texas, Austin, Texas. It is upon stepping out of the drawings’ shades to a distance equal to their mounting height that both their voice and intent, their invocation, approach something transcendent. The drawings coalesce into a painterly organization of form. They are not organized in a way that would initially bespeak productivity. However, if I can consume them in a detached enough fashion, as if intent on crossing over into their world, the messes of calculus and gaseous form idle over a more ordered and accessible absolute borrowed from their rectangular format and the Cartesian indices of technical drawing. By letting its obscure content cling to a system of scale and context whose function is to enable transposition of information outside its boundaries, the whole of the drawing becomes less focused on its own making and its sense of hermetic fascination. My efforts to make that transposition are frustrated by the impossibility of the mess itself which, once established against the connective order of the page, corrupts it with the virus of doubt, as if even the dependability of reference points that could transpose its phantasms into our world through analogy of scale is at risk. However, even in its specific obscurity the vocabulary urges me to strain the content out of the drawing into my world. In these messages from my old friend I can engage the insistence of his passion. I can see the imprint of his life. A life of passion recorded imbues its documents with meaning. 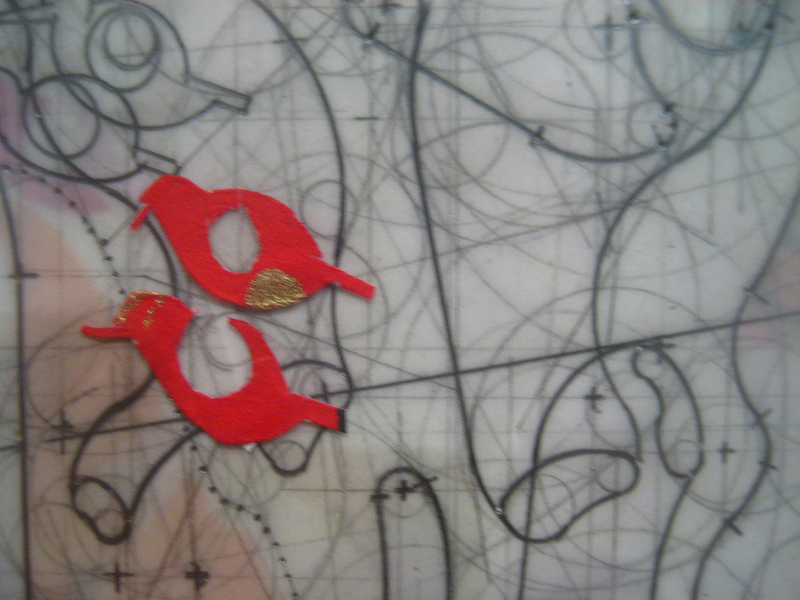 I move toward and away from individual drawings as if tethered. I move slowly, possibly intentionally shuffling my loafers and shrinking inside myself to create the daze I feel after having donated blood, my most lucid frame of mind, somewhat outside my body. The drawings are my only vista from the compressed luminance of the lower half of the room. In the drawing before me, I appear reflected in the glass (Figure 5). Oblique to me, the reflections of far ends of the gallery settle over the tangle of graphite. As if a breeze whispered from that thicket, the light outside the gallery and from the distant sky beyond the glass filters into the furthest hangings from me. In my altered state the effects are native to the terrains and vistas beneath the glass, moving from hallucination to a space expanding through it like a window. Before me again, where I was reflected, clouds now gather on a white sky. I can’t decipher whether I am inside or out, but clearly I am at the demise of two spaces. No other students come into the gallery, I sense nobody in the building. I have the overwhelming desire to have a conversation, to rap on the windows over these lost bits of sky and trapped distances. Although these discursive hauntings are merely the chance of light and state of mind, I note an odd sense of physical completeness to my delusion. (Figure 5) Fast Twitch, Perry Kulper, Texas Range Exhibition, The University of Texas, Austin, Texas. Posted in Essays & features and tagged buildings, drawings, Perry Kulper. Bookmark the permalink.